While most people believe that a pedestrian is someone who is merely walking down the road on either the sidewalk or within a crosswalk while crossing the street, a Los Angeles pedestrian may also be considered a walker, biker, jogger, runner, bicycle rider, skateboarder, rollerblader or anyone else who is not traveling in a motor vehicle, such as a car. In California, pedestrians are given equal rights to use the roads, and in many instances have priority where truck drivers, motorcycle riders, and drivers of cars must yield and give pedestrians the right of way. Despite these safety laws in place for motor vehicles to yield to pedestrians, cars often fail to see pedestrians or they are driving negligently or recklessly where they are talking on their cell phone, applying make-up or even reading a newspaper or magazine while driving. Our Los Angeles pedestrian accident lawyers take pedestrian accidents very seriously, and we are standing by to help you any way we can. Pedestrian laws have been written to protect the safety of people walking near on the city streets. These laws are of even more importance at busy intersections in downtown Los Angeles or streets near LAX airport. Drivers are typically in a rush to reach their final destination and are only looking for other cars and trucks, and often fail to see motorcycles or pedestrians. Each year, there are nearly 80,000 pedestrians accidents where the pedestrians are seriously injured by a motor vehicle, such as a car or truck. As a result of these car crashes, more than 5,000 pedestrians who are killed as a result of these pedestrian accidents, where their families most often bring wrongful death actions on their loved one’s behalf. That works out to be about 14 pedestrians who are killed each day in the U.S. as a result of these accidents. It is important that all of these injured pedestrians receive the best legal representation by hiring a Los Angeles pedestrian accident attorney who will fight for you to receive the most compensation for your injuries. How Are Los Angeles Pedestrians Injured In An Accident? Pedestrians are frequently injured in an accident by being hit by a car, run over by a truck, struck by a motorcycle, or rolling over the top of an automobile where the pedestrian ultimately comes to rest on the pavement, sidewalk, intersection, or on the roadway of the street. The initial impact to the pedestrian can be quite severe, but the resulting injuries upon coming into contact with the ground may cause additional injuries. Further, other cars traveling in either the same direction or in the opposite direction may ultimately run over the injured pedestrian resulting in a wrongful death. Some drivers, after an accident may flee the scene of the accident. If this occurs, this is known as a hit and run accident. What Should You do if You’re Involved in a Pedestrian Accident? There are various law firms and individual lawyers available in the city of Los Angeles who takes care of these types of cases. When you get affected by these injuries as a pedestrian, you can approach these legal entities for adequate assistance. But there are loads of factors which you need to keep in mind while approaching these lawyers. You should be very transparent while discussing the case details with your lawyers. The lawyers always want precise information on how exactly the accident occurred and the overall physical damage caused by the injury. If you can get precise information and also assist the lawyer in providing witnesses who stands by your side, resolving the cases becomes much easier. There are also other precise details which the lawyers want to know like the intersection point or the crossing where the accident took place. After getting all the information from your end, the personal injury lawyer files the case in the court of law. The main objective is to provide the victims with the required justice and also make sure that the right amount of claim can be availed. Generally, a very helpful and methodical mode of work function is maintained by these legal entities. When you approach these lawyers to handle your cases, fees are not charged initially. A step by step approach is implemented by these lawyers and each of the cases is handled with care. An adequate amount of research is carried out before drafting the case files. As the main focal point is to guide the victims accordingly, so that they get the required compensation, a number of factors come to the forefront. Reports have revealed a startling fact. Children are easy prey to the rash accident menace in Los angles. They are often grievously injured if not loss their precious lives in such mishaps. Survey has opened up another heart-wrenching data. Kids below the age of 4/5 involve approximately 40+ percent of accident deaths, involving pedestrians. It is high time that responsible parents extensively guide their children about road safety rules right from their tender age. They should teach their kids that caution has no alternative while crossing the major road intersections, especially during rush hours of the day. It is suggested to look at either side of the roads while crossing the road junctions. Moreover, it has been noticed that accidents occur more frequently during festive times, especially during Christmas and Halloween. Children should carry torch or flashlights during Halloween nights as this occasion is known for high-level of traffic even during night. Following the accidents, the insurance companies often misuse the ignorance of the general victims. They often try to obtain a written disclaimer, duly signed by the accident victim or his/her immediate family member that drastically reduces the fair compensatory amount. Moreover, these unscrupulous insurance organizations hanker for finalizing a hush-hush deal with the pedestrian victim that leads the victim into a trap and ignore his/her legitimate demand for availing medical costs, loss of wages and other financial issues that may accompany the accidents. Experiencing any of the above circumstances could make you eligible for your recompense claim for injuries, and if your near one died of a road accident, then also you might claim compensation on their behalf or for the loss. If you do not memorize what happened or are not sure of who was to blame, you can go for help form accident investigation team to find witnesses and assist you work on your claim. Professionals can also advise on financial planning to ensure that you and your family are taken care of not just temporarily, but in the long term too. 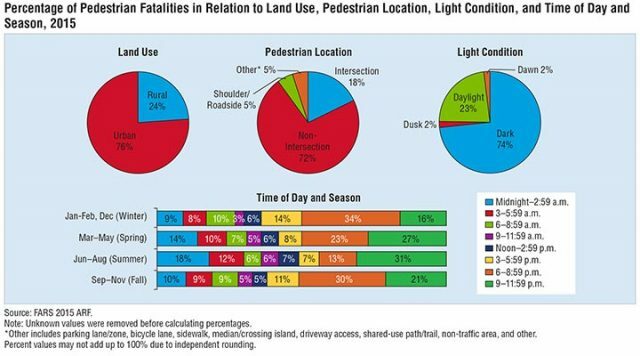 season) describing where and when pedestrian fatalities occurred in 2015.
shoulders, and the remaining 5% were at other locations such as parking lanes/zones, bicycle lanes, sidewalks, medians/crossing islands, driveway accesses, shared-use paths/trails, non-traffic way areas, and other sites. 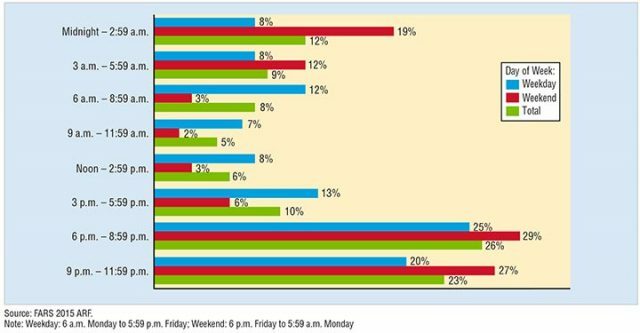 ■ More occurred in the dark (74%) than in daylight (23%), dawn (2%), and dusk (2%). ■ Time of day is divided into eight 3-hour time intervals starting at midnight, and season is defined by months. fatalities occurred from 6 to 8:59 p.m., followed by 16 percent from 9 to 11:59 p.m., and 14 percent from 3 to 5:59 p.m.
followed by 23 percent from 6 to 8:59 p.m.
time, followed by 18 percent from midnight to 2:59 a.m.
largest group was 21 percent, during the hours 9 to 11:59 p.m. In Figure 2, time of day is divided into eight 3-hour time intervals starting at midnight, and day of week is defined as weekday (6 a.m. The highest total percentage (26%) occurred from 6 to 8:59 p.m., followed by 23 percent from 9 to 11:59 p.m. The lowest total percentage (5%) occurred from 9 to 11:59 a.m., followed by 6 percent from noon to 2:59 p.m. The highest weekday percentage (25%) occurred from 6 to 8:59 p.m., followed by 20 percent from 9 to 11:59 p.m. The highest weekend percentage (29%) occurred from 6 to 8:59 p.m., followed by 27 percent from 9 to 11:59 p.m.
More than one-fifth (21%) of children 14 and younger killed in traffic crashes were pedestrians. Children 10 to 14 years old had the highest percentages of estimated pedestrians injured (7%) among the different age categories. Children in the age groups 0 to 4 and 5 to 9 years old had the highest percentage, 21 percent, of pedestrians killed. The average age of pedestrians killed in traffic crashes was 47. The estimated average age of pedestrians injured in traffic crashes was 38. Over the past 10 years, the average age of those killed has increased slightly, from 45 to 47; similarly, the average estimated age of those injured rose from 35 to 38. Nineteen percent of all pedestrian fatalities (1,002 of 5,376) and an estimated 13 percent of all pedestrians injured (9,000 of 70,000 after rounding) were people 65 and older. the presence of alcohol may or may not be a contributing factor in the crash. “No alcohol” refers to a blood alcohol concentration (BAC) of .00 grams per deciliter (g/dL). Table 4 charts the estimated alcohol involvement for fatally injured pedestrians by the alcohol involvement of all drivers involved in those crashes, whether the drivers were killed or not. If more than one pedestrian was killed in a crash, the pedestrian with the highest BAC was used. If more than one driver was involved in a crash, the driver with the highest BAC was used. An estimated 34 percent of fatal pedestrian crashes had pedestrians with BACs of .08 g/dL or higher. An estimated 15 percent of fatal pedestrian crashes had drivers with BACs of .08 g/dL or higher. An estimated 35 percent of pedestrians killed had BACs of .08 g/dL or higher in 2015, compared to 38 percent in 2006. In 2006, fatally injured pedestrians in the 21- to 24-year-old age group had BACs of .08 or higher more frequently than other age groups, an estimated 56 percent of the time. In 2015, pedestrians 45 to 54 had BACs of .08 most frequently, 45 percent of the time. Passenger cars and light trucks (including SUVs, pickups, and vans) had higher percentages of frontal impacts than other vehicles such as large trucks or buses. (525) were killed in multi-vehicle crashes. Pedestrians who died in single-vehicle crashes were most likely to be struck by the front of the vehicle, rather than the side or rear. Buses and large trucks had the highest percentage of right-side impacts and rear impacts, respectively. Almost one-fifth (19%) of the pedestrians killed in 2015 were struck in single or multi-vehicle crashes that involved hit-and-run drivers. For each State and the District of Columbia, for 2015, Table 7 presents the total resident population, total traffic fatalities, pedestrian fatalities, percentage of pedestrian fatalities of total traffic fatalities, and the rate of pedestrian fatalities per 100,000 population. Note for this section, as well as the following section on fatalities by city, that the populations of States and cities can vary greatly from the recorded resident population. States with substantial seasonal tourism, such as Florida, and cities with a large influx of daily commuters, such as Washington, DC, have at times a substantially larger population than is reflected in their numbers of residents. The total motor vehicle traffic fatalities ranged from a low of 23 (District of Columbia) to a high of 3,516 (Texas). The number of pedestrian fatalities was highest in California (742), followed by Florida (628) and Texas (537). South Dakota, Wyoming, and Vermont had the fewest number of pedestrian fatalities, 5 in each of those States. 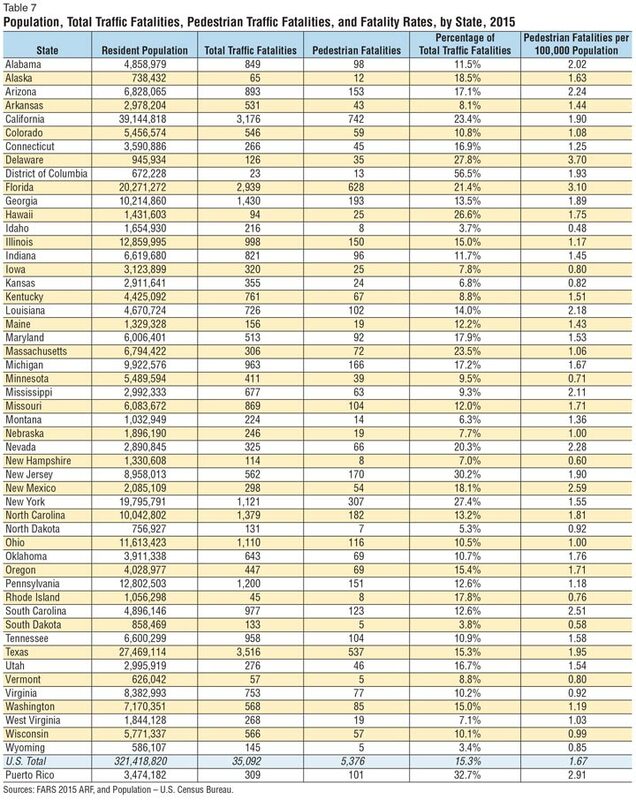 The State percentages of pedestrian fatalities by total traffic fatalities ranged from a low of 3.4 percent (Wyoming) to a high of 56.5 percent (District of Columbia), compared to the national average of 15.3 percent. The highest State pedestrian fatality rate per 100,000 population was in Delaware (3.70), followed by Florida (3.10). Idaho had the lowest pedestrian fatality rate per 100,000 population, 0.48. Traffic Safety Information website at https://cdan.nhtsa.gov/stsi.htm. Walk on a sidewalk or path when one is available. If no sidewalk or path is available, walk on the shoulder, facing traffic Stay alert; don’t be distracted by electronic devices, including smart phones, MP3 players, and other devices that take your eyes (and ears) off the road. Be cautious night and day when sharing the road with vehicles. Never assume a driver sees you (he or she could be distracted, under the influence of alcohol and/or drugs, or just not see you). Make eye contact with drivers as they approach. Be predictable. Cross streets at crosswalks or intersections when possible. This is where drivers expect pedestrians. If a crosswalk or intersection is not available, locate a well-lit area, wait for a gap in traffic that allows you enough time to cross safely, and continue to watch for traffic as you cross. Be visible. Wear bright clothing during the day, and wear reflective materials or use a flashlight at night. Avoid alcohol and drugs when walking; they impair your judgment and coordination. Look for pedestrians everywhere. Pedestrians may not be walking where they should be or may be hard to see especially in poor lit conditions, including dusk/dawn/night and poor weather. Always stop for pedestrians in the crosswalk or where pedestrian crosswalk signs are posted. Never pass vehicles stopped at a crosswalk. They may be stopped to allow pedestrians to cross the street. Slowdown and look for pedestrians. Be prepared to stop when turning or otherwise entering a crosswalk. Follow the speed limit; slow down around pedestrians. Stay focused and slow down where children may be present, like school zones and neighborhoods.